Cedar Chalet A- Frame is situated on five acres and is surrounded by Tamarack, Ponderosa Pine, and Hemlock trees. The property is frequently visited by deer, elk, wild turkeys and other wildlife. Pets are NOT allowed, No Smoking. 2 bedrooms with a queen bed in each, 2 full bath, full kitchen and dining area. Outside deck with table, BBQ and hot tub. Rates are $250 per night for 2 guests. $25 for each additional guest. The maximum number of guests is 4. Please be sure to call and inquire about any information or special requests. Rates are subject to change. Two full bathrooms with towels supplied. Made of log and seats up to 4. Everything was as shown in the pictures. We had a very relaxing enjoyable time. Above average vacation home. We will come back again. This chalet is tastefully furnished and decorated with all the conveniences of home: granite countertops, updated appliances, big screen TV's, a jacuzzi, even nearly tame deer. Don, the caretaker, and his son are very helpful. They gave us us excellent dining and sightseeing advice. Wonderful people! We thoroughly enjoyed our stay. The cabin was exactly what I was hoping for. The cabin was a great stay. It was close to town but far enough away that you felt like you were completely on your own. Lots of wildlife walking through the yard and it was a very peaceful experience. The property was clean and well taken care of and if I needed help everybody was extremely accommodating. I would highly recommend staying here for anybody looking for a peaceful quiet retreat. We've stayed at many Home-Away properties over the years and The Cedar Chalet exceeded our expectations. The owner and the property manager went our of their way to make us feel at home. Our flight arrived 12 hours late that day and the property manager stayed up to meet us at 1:30 AM just to make sure we were OK, explain how everything worked and let us know he was there to help if we needed anything. 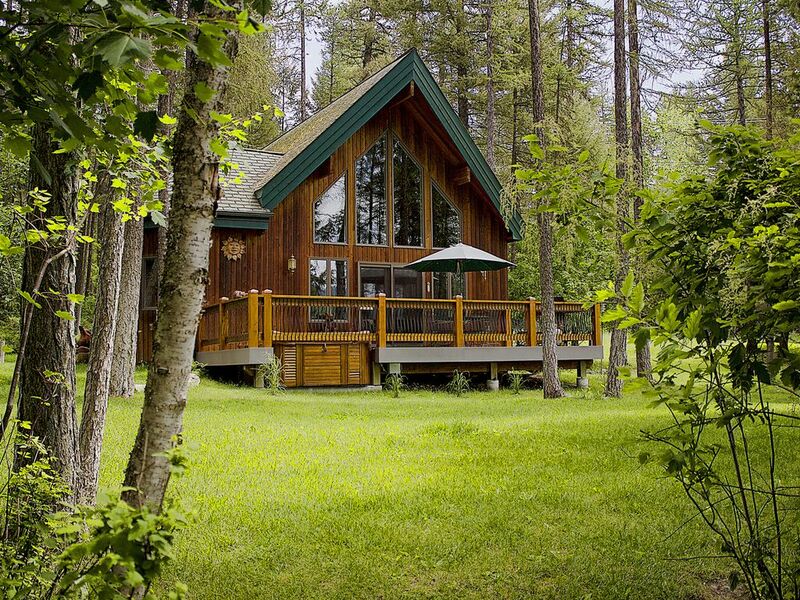 The Cedar Chalet is a beautiful and comfortable property. The hot tub was great and the 2 large screen TV's with hundreds of channels made the little time we had for relaxing in the evening great. The location feels like you're out and away from town, but when needed, a drive to town is about 12 minutes from the Chalet. The hiking in Glacier National Park is great. We enjoyed doing some good ones everyday. We'd very much enjoy coming back again. The house was immaculate and in a great location--close to town for dinner options and close enough to Glacier National Park to make it an easy drive. Both the host and caretaker were very accessible if needed but not intrusive. They made sure we had what we needed. As others have said, it was fun watching the deer and turkeys come through the yard each day. The weather did not always cooperate but even when we stayed in, the house was cozy and comfortable--just what we needed for our getaway. The many satellite stations even allowed for some good football watching! Would definitely stay here again! Perfect location to everything we wanted to do/see. Glacier, white water rafting, zip lining!! The chalet is just beautiful. We cooked on the grill every night and watched deer, turkeys and the stars. A little piece of heaven for our vacation. Highly recommend. Price Rate of $250 is for 2 guests per night. Please add $25 for each additional guest. Maximum of 4 guests. Rates are subject to change. Please call for your specific request. Thank you.